These biblical guidelines make for a worldview that is sharply distinguishable from the worldviews around us, even where there are overlapping values. We cannot embrace unrestrained secularism; democracy is not God; freedom can be another word for rebellion; the lust for power, as universal as it is, must be viewed with more than a little suspicion. This means that Christian communities honestly seeking to live under the Word of God will inevitably generate cultures that, to say the least, will in some sense counter or confront the values of the dominant culture. But to say the least is not enough. Christians thus shaped by Scripture envision of church that not only counters alternative cultures but also seeks sacrificially to serve the good of others — the city, the nation, common humanity, not least the poor. Salt does not confront; it enhances. Believers must be the best possible citizens (cf. Jeremiah 29:7; cf. also 1 Peter 1:1; James 1:1), and that means that Christians, who are taking their cue (and thus their worldview) from outside the dominant culture, not only shape and form a Christian culture recognizably different from that in which is embedded but also become deeply committed to enhancing the whole. DT: Why don’t you like the terminology of “redeeming the culture”? DC: Redemption terminology in the NT is so bound up with Christ’s work for and in the church that to extend it to whatever good we do in the broader world risks a shift in focus. Not for a moment do I want to deny that we are to serve as salt and light, that exiles may be called to do good in the pagan cities where Providence has appointed them to live (Jer 29), that every square foot of this world is under Christ’s universal reign (even though that reign is still being contested), that the nations of the world will bring their “goods” into the Jerusalem that comes down from above. But many of those who speak easily and fluently of redeeming the culture soon focus all their energy shaping fiscal and political policies and the like, and merely assume the gospel. A gospel that is merely assumed, that does no more than perk away in the background while the focus of our attention is on the “redemption” of the culture in which we find ourselves, is lost within a generation or two. At the same time, I worry about Christians who focus their attention so narrowly on getting people “saved” that they care little about doing good to all people, even if especially to the household of God. Getting this right is not easy, and inevitably priorities will shift a little in various parts of the world, under various regimes. Part of the complexity of the discussion, I think, is bound up with what the church as church is responsible for, and what Christians as Christians are responsible for: I have argued that failure to make this distinction tends to lead toward sad conclusions. Take special note of 42:10 to 46:30 in the second one. I must admit, once I started Memoirs of an Ordinary Pastor, I could barely put it down. This has to be one of the most challenging and yet encouraging books I have read in quite some time. As far as biographies go, this one was unlike any other biography I have ever read. We naturally gravitate toward biographies of the heroes of the faith. And we should. God used men such as Whitefield, Calvin, and Luther to alter the flow of Christian history and literally to change the world. We long to know what made them so fruitful in their ministries. What personal disciplines did they practice? What methods did they use in personal Bible study? How did they maximize the use of their time to bring the most glory to God? All wonderful questions we should be asking. And a taste of Nooma videos for yourself. 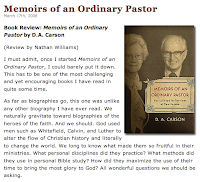 This looks like one I’d want to read, Carson’s Memoirs of an Ordinary Pastor.